My first dinner party was a total disaster. Newly married, never having cooked much – my mother and grandmother were disinterested in food, their heads either buried in books or out in the garden pruning roses – but full of misplaced confidence in my ability to read a recipe and actually produce a dish that might be even vaguely edible. I decided on a tuna and bean casserole followed by a pavlova, both very ‘in’ in those days. These dishes would be preceded by squares of cheese and nuts served in crystal bowls (a wedding present). I draw a veil over that night. The tuna and bean number was more a catastrophe than a casserole- the beans almost raw, the white sauce lumpy and tasting of flour and not nearly enough tinned tuna. The pavlova was a flat, brownish disc, on to which I piled strawberries, most of which not quite ripe. The whole meal was many hours late, because I forgot to turn on the oven for a while. However, all was not lost because the whole group got roaring drunk – except me. I spent a lot of time in the bathroom, sobbing. The dinner party story has changed quite a bit. Instead of formal, four course dinners with matching wines and everything on the table tickety-boo, things are way more casual. Good friends or family often supply some chocolates or a small gift of homemade jam or chutney for the hostess. And everyone, always, brings a bottle of wine, or some beer. I guess I’m an old-fashioned girl, because I still like to cook three courses usually, or maybe substantial nibbles with drinks, followed by a main dish and a dessert or cheese. My table is now much less formal than it used to be, and I do a heck of a lot of preparation beforehand and make endless lists so I’m not tearing my hair out in the kitchen and missing all the gossip. Now I only buy sturdy glasses that can take a lot of punishment and can fit into the dishwasher. And I never, EVER, serve fondue. Those were the days of the prawn cocktail, steak Diane, carpetbag steak, apricot or marengo chicken, beef stroganoff, chicken a la king, served on Arabia ware plates. Some people made cocktails, Brandy Alexander was a fave of mine, and the wine list included, palfrey pearl, blue nun, mateus rose, something red in a bottle bound in raffia and like Ben Ean moselle, later used with a candle in it. The more wax dribbled down it the better. There might be music on the stereogram, but generally conversation was about politics and sport, which could get quite (good naturedly) heated. People drank more than they should using commonsense (ie the wife drove the Holden home) as there was no such thing as a RBT. 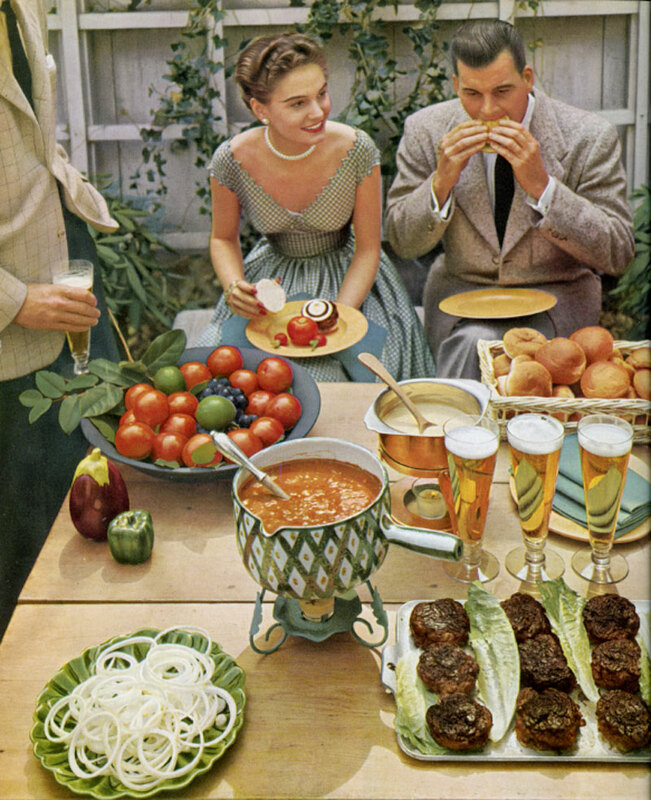 But the party I recall most was when one of the children stirred as the horses doovers were being passed (bacon wrapped prunes, cheese straws, devilled eggs, toothpicks speared with coloured cocktail onions and cheese and cabanossi). The three children, all under six, were always packed off to bed at 7.30 and never were seen or heard till morn. Mothers ruled in those days. But he’d been sick so I (carefully) lay beside him in my little black taffeta cocktail dress to comfort him. The next thing I opened my eyes and sunlight was streaming in the window. I’d slept through the party. The food had all been prepared and so the guests helped themselves and my husband poured them out the door in the wee hours. I’m told they had a grand time. Mothers being time poor and juggling housework, kids and a part time job…well, what’s changed? What’s changed, I observe, is that we entertain more casually, sharing the food and letting the kids and dogs run riot, a football game or DVD blaring, generally unwatched, the men in one group and the gals in another. There’s not a lot of meaningful talk or political debate, perhaps that is more to do with age. But so long as I never have to sit at a table with everyone on their damn iPads and smart phones, I’ll enjoy the company and keep my old time dinners in the memory bank. From the “Life Picture Cook Book”. Photo by Ben Rose. Holding a dinner party for me is a wonderful and special opportunity to share my love of food and beauty. One such dinner party springs to mind. It was late summer so my favourite flower, the old fashioned white marguerite daisy, set my theme. Once the invitation was extended, six to eight guests, I spent days writing my menu, sourcing the best and freshest food in season. It could all be done on a modest budget. The table took hours to get “just right” – flowers, candles, crystal glasses sparkling, beautiful linen napkins tied with a yellow chiffon bow to match the centre of my favourite daisy. Elegant salt and pepper shakers, condiment bowls – everything spoke of the promise of the meal to come, with wine and champagne chilling to perfection. I spent the full day preparing, always a minimum of three courses, keeping the food simple but full of flavor, preparing as much as possible beforehand, as I did not want to miss the party. We always enjoyed a beautifully chilled glass of champagne on the guests’ arrival. People dressed elegantly if not formally. Have we forgotten how much pleasure wonderful and simple occasions can bring? A picnic in the park with lovely rugs and fluffy pillows, baskets filled to overflowing with simple but yummy food, sun and friendship warming your heart. A Father’s Day meal of homemade roasted pumpkin soup, roast lamb and a yummy big warm apple pie with double cream, the table dressed with lovely linen and covered with vases of bright yellow daffodils. It’s all about love. Dining out these days, one is normally seated at a table with no tablecloth, no welcome such as a small vase of flowers, salt and pepper comes in paper packets, as does sugar, people sitting waiting for their meal using mobile phones, not communicating with each other. Why bother going out? We are cheating ourselves of all the wonderful emotions that food and friends can bring into our lives. How many families eat the evening meal together, no TV, no mobile phones? I try to teach the next generation that the simple things in life, like sitting around a festive table can bring the greatest and most fulfilling rewards and memories.